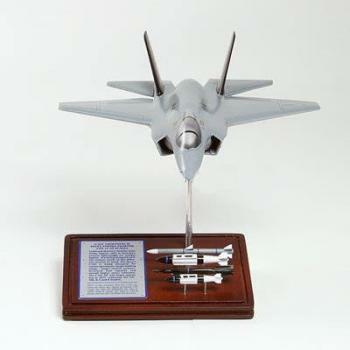 F-35C Joint Strike fighter with bombs on base [APWB-008] - $219.95 : Metalcraft by Blair - military gifts and memoribilia. MOST POWERFUL AERO COMBAT FIGHTERS! We bring you POWER and STRENGTH in a new design that features a handcrafted desktop model plane loaded with precisely scaled armaments, all in a more compact size! A HIGHLY DETAILED model airplane that boasts its real-life counterpart’s POWERFUL WEAPONS, this is a RARE model that SHOULD be in YOUR collection! This F-35C JSF display model airplane is every bit as powerful as the real thing! It is masterfully sculpted from mahogany wood and meticulously hand-painted by highly-experienced Master artists committed to faithfully capturing the glory of one of America’s greatest strengths and pride. Here’s a FULLY LOADED MODEL that’s definitely MORE THAN THE USUAL at such a LOW PRICE! "IN STOCK AND READY TO SHIP DIRECT FROM West Virginia WAREHOUSE"
If desired we can replace the aircraft description sticker with an engraved name plate and the verbage of your choice ---- additional cost of only $12.50---- you will need to contact us seperately for this service.